I finally got around to continuing my Storybook Rag Pets collection with Gretel from "Hansel and Gretel". 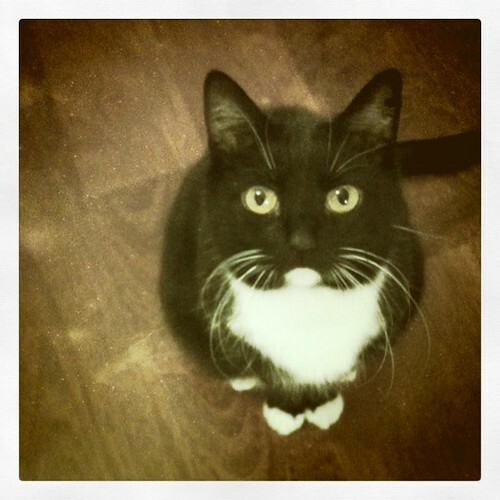 Poor Gretel has been waiting for her dress and photo shoot for some time now. I kept putting her off, since I had other, more seasonal, Rag Pets to make and I was wanting to take her photo in the forest, but it doesn't seem like the snow will ever melt, so I made do with indoors and leftover gingerbread instead. 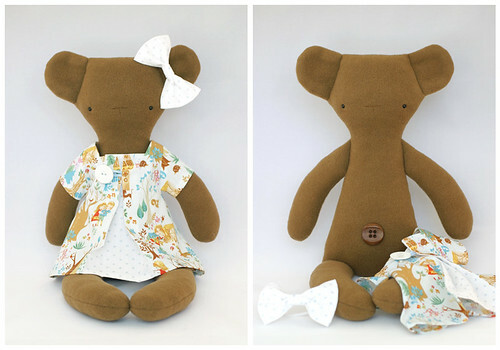 Gretel the rag-bear is wearing a dress made from lovely soft cotton with a Hansel and Gretel print by Cosmo Textiles and a fun, flocked swiss dot fabric in the inset. Her bow is made from the swiss dot fabric too. 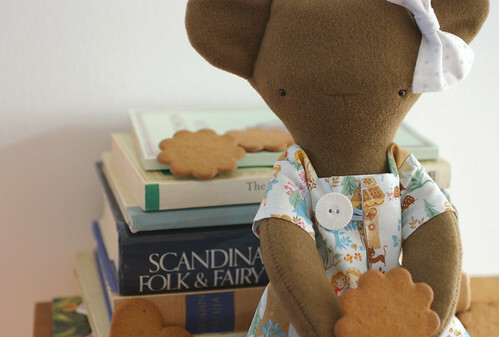 Gretel herself is made from gingerbread brown wool and she has safety eyes and a brown button for a belly button. It's Valentine's Day (or Ystävänpäivä, "Friend's Day" as it's called here) and to celebrate this day filed with love and kindness and all things nice, I made a special Valentine's Rag Pet. This is Fancy the rag-deer. Fancy is a very dear deer indeed. She loves chocolate bon-bons, love letters and all her dear friends. 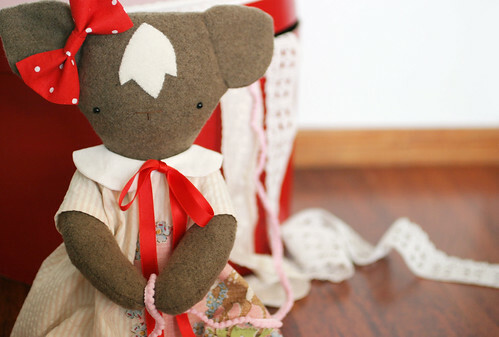 Fancy is made from chocolate brown wool and she has a white wool applique mark on her face and spots on her bum. She has a dark chocolate plastic button for a belly button, safety eyes and a perky little deer tail. 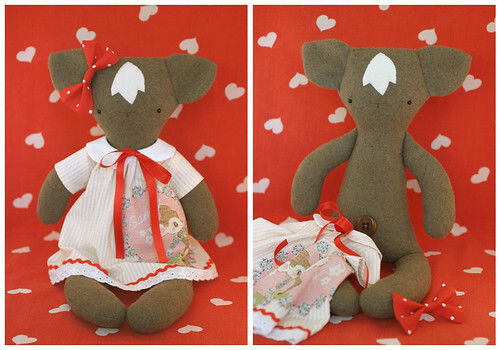 Fancy is wearing a pink and yellow seersucker dress with a linen Bambi-heart applique, Peter Pan collar with a red satin bow and ric-rac and lace on the hem. She's also got a red & white spotted cotton ear-bow. 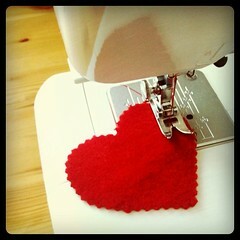 Wishing you all a really lovely and very happy Valentine's Day! Just popping by to tell you that along with a bunch of wonderfully talented bloggers, I did a guest post on Meg Spaeth's very inspirational blog Elsie Marley, while Meg herself is on holiday. 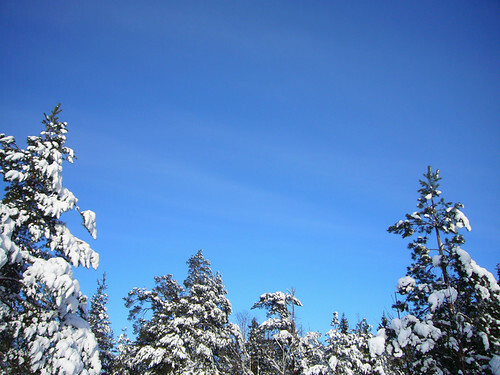 I wrote about a walk I took in the little forest across the street to enjoy the gorgeous winter weather we've been graced with today. A new year always brings with it new things and new beginnings. I started a 365 Pictures Project this month, I'm going to try and take a photo every day for a whole year. It was a bit of a spur of the moment decision this, but since I now have an iPhone with a rather nice camera and growing love for brilliant and fun photography apps like Instagram and Hipstamatic, I think I have a fair chance of seeing this through! It's nice to challenge myself, to see if I can stick to this and if I can come up with 365 photos that aren't all of the cat! Another new thing I've started is a Tumblr blog. All the cool kids seem to have one, and I'd like to be a little bit cool so I thought I'd make one too. I also have a whole lot of pretty pictures and things that I've collected and I thought it'd be nice to share them with others to be inspired by too instead of just stuffing them into a folder. 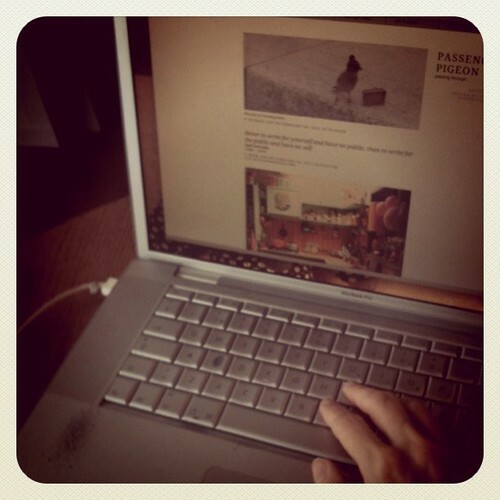 I thought long and hard about the name for my Tumblr, and I settled on Passenger Pigeon, because the "passenger" in passenger pigeon comes from the French word passager, meaning "to pass by", which is apt since my Tumblr will be a collection of bits and bobs I've come by while surfing about and that have caught my fancy. And of course, because pigeons are most awesome! Claire, the person behind Absolutely Small, and the ever brilliant utterly fantastic Chickenpants, is a really great person, super funny and so creative she makes people (she's currently on maternity leave) and if you haven't already, go acquaint yourself with her and her work! 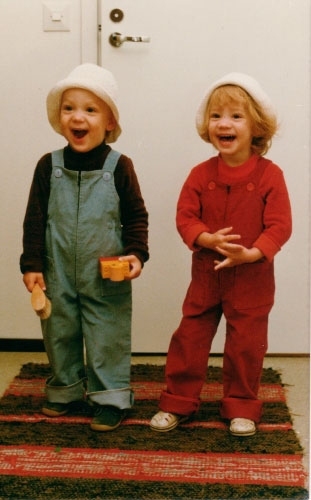 My brother and me, at about age 2 or so, having the time of our lives! I have a twin brother, and asides from being born on the same day (I'm all of 7 minutes older than my brother), I don't think we differ much from any other siblings. Then again, I have no experience of being anything other than a twin, so I can't really say for sure. As kids we were close, we were a unit, more a "we" than "me", but as we got older we grew more apart -as I suspect all siblings do. We don't look any more alike than any other brother-sister pair, and we have different and distinct personalities. Still, I really value being one half of an extraordinary (twins make up less than 2% of the world's population) pair and even though being a twin isn't all roses and rainbows and special connections, I wouldn't change it for the world!